How wide is the widest street in the world? I wanted to know. 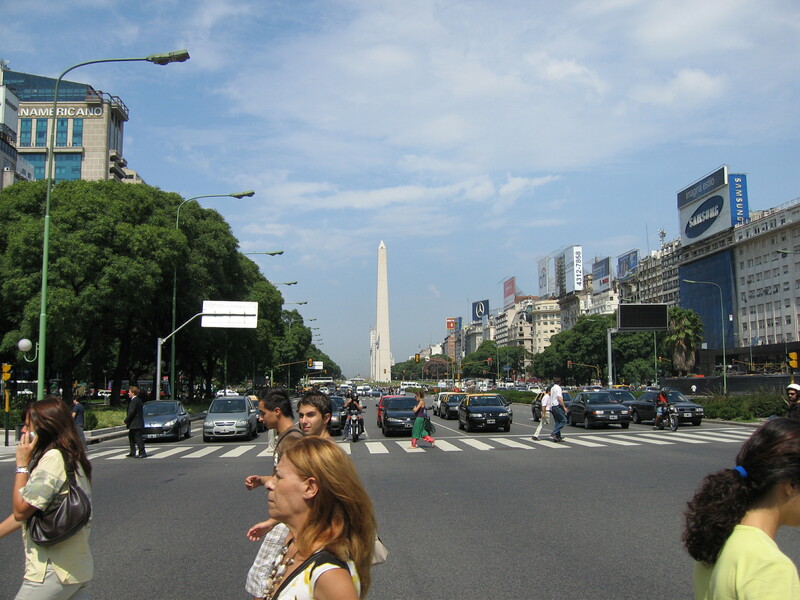 But I didnâ€™t feel like measuring Avenida 9 de Julio with a yardstick and turning into the loco gringo. Britannica.com says, flat out, that itâ€™s the widest street anywhere. But to get the details you need a credit card number to activate a free trial -- you know how that works. But, you may ask, whatâ€™s the point of the widest street in the world? Sometimes it seems as if you need to be a quarterback to cross the 20 lanes of traffic on foot â€“ despite the big green strips that break up the lanes into three, seven, seven, and three. Itâ€™s probably safe to say the short answer, beyond mere traffic planning, is this: Itâ€™s monumental. Yes, they lost some beautiful old buildings when they carved out the avenue. And parts of it arenâ€™t all that attractive. But what a great place to put a 223-foot obelisk. El Obelisco isnâ€™t as tall as the 555-foot Washington Monument. But itâ€™s part of BAâ€™s street life. Itâ€™s a guidepost. And a very big exclamation point: Hey, you! Youâ€™re in Buenos Aires! And itâ€™s a place to make a point. Lots of protest marches there. On World AIDS Awareness Day, they slipped a giant pink condom over the obelisk. Now thatâ€™s cool. Itâ€™s an icon whose appeal I canâ€™t quite put my finger on. Why does a view of it from half a mile away, down a narrow crowded side street, seem so much more dramatic than a shot of the D.C. monument? Iâ€™m not sure. But meet me at el Obelisco.